The historic village of Cumberland Furnace in Dickson County. 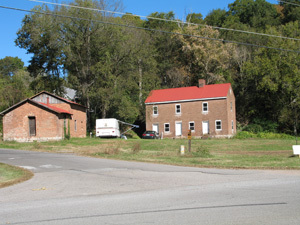 Located in northern Dickson County is the historic village of Cumberland Furnace, the site of the first ironworks in the region which later became Middle Tennessee. The village is the oldest community south of the Cumberland River between Nashville and Clarksville. It made Dickson County a manufacturing area from its frontier beginnings. General James Robertson, like other pioneer surveyors, soon discovered that the Western Highland Rim contained abundant iron ore deposits. In 1793 Robertson and William Sheppard purchased 640 acres from James Campbell, a private in North Carolina’s Continental Line. On this tract, located on the west branch (now Furnace Creek) of Bartons Creek, Robertson erected the furnace for his ironworks. The forge was built closer to the mouth of the creek. The furnace went to blast in 1796. Eight years later Montgomery Bell, a native of Chester County, Pennsylvania, bought the furnace from Robertson for $16,000. Bell improved the efficiency of the furnace and made his iron plantation more self sufficient. Sometime between 1810 and 1820, Bell erected a second furnace. By 1812 he had a contract to furnish the national government with cannon shot, gunpowder, and whiskey. During the War of 1812 Bell became the chief supplier of heavy ammunition for both the navy and General Andrew Jackson’s army. The 1820 manufacturer census showed Montgomery Bell’s new furnace producing 300 tons of hollow-ware, 50 tons of pig iron, and 6 tons of machinery, with 70 men, mostly slaves, working the furnace. In 1825 Anthony W. VanLeer, also a native of Chester County, Pennsylvania, with Isaac H. Lanier and Wallace Dickson, purchased the furnace from Bell for $50,000. Montgomery Bell built other furnaces and forges in Dickson County and became Tennessee’s first capitalist and industrialist, as well as a legendary figure in state folklore. In 1833 VanLeer bought Lanier’s and Dickson’s interests for $70,000. He dismantled the first furnace, rebuilt Bell’s second furnace, and later introduced steam power. In 1860 Cumberland Furnace produced 1,831 tons of pig iron with a mostly slave work force of 93 men and 7 women. After the fall of Fort Donelson in February 1862, Cumberland Furnace ceased operations for the duration of the war. Unlike other ironworks in the Cumberland River counties, it was not destroyed. On the death of Anthony VanLeer in July 1863, two grandchildren, Vanleer Kirkman and Mary Florence Kirkman, inherited the Dickson County furnace. Mary Florence and her ex-Union officer husband, Captain James P. Drouillard, reopened the furnace after the war. In 1870 Mary Florence Drouillard bought her brother’s share for $20,000 and her interest in the Nashville properties. The Drouillards operated the furnace as a family business, making it a successful enterprise even during the 1874-79 recession years. They rebuilt the furnace and by 1880 were producing 20 tons of pig iron a day with 250 employees. In 1882 James Drouillard formed the Drouillard Iron Company, a stock company over which he served as president. The new company paid the Drouillards $170,000 for the furnace and land totaling over 17,000 acres. In October 1889 the Drouillard Iron Company sold out to the Southern Iron Company, an Alabama corporation controlled by the Warner family, for $140,000. With a six-mile spur connecting to the newly constructed Mineral Branch Railroad, Southern Iron Company built a modern coke-fuel furnace. As a result of the 1893 panic, the new owners declared bankruptcy in 1895. The Warner brothers reorganized the Buffalo Iron Company and reopened the furnace in 1896 but were out of business two years later. Determined to stay in the iron business, the Warner family formed the Warner Iron Company in 1899. In 1917 the furnace and all property were conveyed to Joseph Warner, who increased production by updating the facility. In the mid-1920s Jeff Gray sued Warner over a patent right to manufacture ferrophosphorus iron. The seven-year trial cost Warner the railroad and depleted his finances. During the Great Depression, the furnace operated intermittently until 1938, when Warner declared bankruptcy. In July 1940 the Chancery Court transferred the property to Cumberland Iron Company, a Nashville corporation headed by Rogers Caldwell. In 1942 Caldwell obtained a loan from the Reconstruction Finance Corporation and reopened the furnace. It operated only a few months before auditors found irregularities, and the government closed the facility. In October 1943 Sol Chazen, a Chattanooga scrap dealer, purchased the property and dismantled the furnace for the wartime scrap metal drive. In 1988 the village of Cumberland Furnace, with over thirty buildings and sites associated with the iron industry, was listed as a historic district on the National Register of Historic Places.